“It’s been 50 years? Wow. Really? Half a century, huh. Seems longer... like when your annoying, unsuccessful, know-it-all uncle with no common-sense crashes on your couch for seven weeks which feels more like seven never-ending years. You put up with it because you realize he’s sort of in-the-family, but you secretly wish he would just go away. It’s like that. But with purple.” --- Wisconsin Governor Jim Doyle reacting to news that the Minnesota Vikings are celebrating their 50th year in the NFL. To mark the team’s 50th year of mediocrity in the NFL, the Minnesota Vikings introduced three new designs which they say reflect the past, present and future of the NFC North team. (August 28, 2010) --- This year, the Minnesota Vikings begin their 50th season in the NFL, and since 1961 the team from the Land of 10,000 Lakes has provided a valuable role in professional football. For every winner there are dozens of losers, and over the years the Vikings have embraced that role. They recognize their limitations and accept their shortcomings. In Minnesota they know that if you can't do something well, then learn how to enjoy doing it poorly. With this mantra in mind, the Minnesota Vikings have launched a new integrated marketing campaign to celebrate, what they call, "50 Seasons of Near Greatness in the NFL." 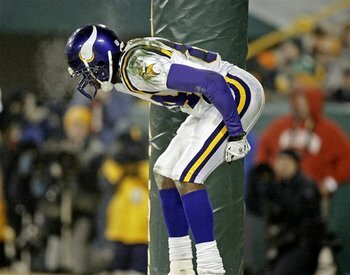 The Vikings organization is planning dozens of interactive events and entertaining specials for all of their fans in 2010 from “Interception Sunday” and “Complimentary Projectile Night” to an extra-special “MetroDome Implosion Day” to be held during halftime of their last regular season home game. This season will also be a time for Minnesotans to drink heavily and remember the history of their franchise with a look back at how the Minnesota Vikings stumbled into professional football. In fact, not too many fans realize that football in Minnesota traces back to the 1920’s when the Duluth Eskimos were a traveling team in the NFL. With no stadium to call their own, the Eskimos had to journey from town to town to take on each of their opponents, sadly, with little success. It was during one very snowy November at the conclusion of the 1927 season while the 1-8 Eskimos were heading back to Duluth when their dog-sled team took a wrong turn at Lake Minnewawa, encountered a blinding snowstorm, and were never heard from again. That was, until the spring of 1960 when a longtime Koochiching resident, getting in some late-season ice-fishing, discovered the entire football squad encased in a frozen block of snow and ice. After consulting the experts at Butterball, the team was left in a large refrigerator overnight, submerged in room-temperature water for about a week and then garnished with stuffing and cranberry sauce until all were thawed completely. Immediately after the stalactites disappeared from their arms, heads and balls, the team was reactivated by the NFL and then relocated to the Twin Cities in 1961 where they were rechristened the Vikings... a name they say perfectly fit their ravaging and plundering Scamdinavian background. 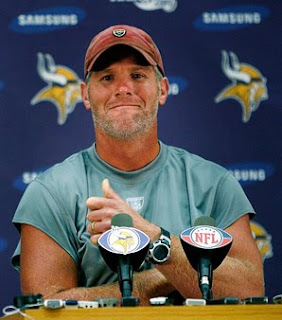 Brett Favre announced that he will take the Minnesota Vikings to the Super Bowl this season. Turns out he’ll be able to get the whole team some pretty good seats at the game ths February with his senior discount. And here they are 50 years later (despite an empty Super Bowl trophy display case, the Dimitrius Underwood debacle, directionally-challenged defensive ends, Jeff George, a home stadium that likes to collapse, having to wear purple, Randy Moss, a desire to spend time in boats on lakes with hookers, the Herschel Walker trade, Brett Favre’s indecisiveness and a habit of choking in the big games that really count) celebrating the fact that the Minnesota Vikings are still in Minnesota.